Eritrean President Isaias Afwerki has hailed the ending of an “epoch of conflict” in the Horn of Africa during a visit by his Somalian counterpart to mend ties after years of animosity. Somali President Mohamed Abdullahi Mohamed’s three-day visit to Asmara coincides with a fast-track peace process between Eritrea and Ethiopia — part of the dizzying change in a region burdened by war, proxy conflicts, isolation and iron-fisted rule. At a state banquet on Sunday, Afwerki hailed the historic ties between Somalia and Eritrea and bemoaned the gloomy post-Cold War history of the Horn of Africa. Ethiopia and Eritrea three weeks ago declared an end to two decades of conflict, rapidly restoring diplomatic ties and flights between their capitals. Somalia and Eritrea were once close, with Mogadishu’s military regime under dictator Siad Barre backing the long fight for independence from Ethiopia, which was attained in 1993. Somalia fell into chaos and civil war after the fall of Barre in 1991. It then became the site of what observers called a proxy war between Eritrea and Ethiopia from around 2006. 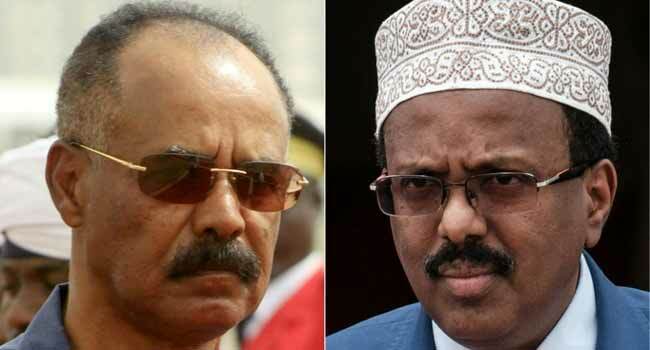 Ethiopia was backing a weak interim government in Mogadishu while Eritrea was accused of backing the Islamic militants fighting to overthrow it, a charge it denied. Ethiopia has already formally requested that these sanctions be lifted against Eritrea. “There is no doubt whatsoever that the people of Somalia will, as ever, be fellow travellers with the peoples of Ethiopia and Eritrea,” said Afwerki. On his visit, Mohamed and Afwerki have discussed the restoration of diplomatic ties, as well as economic and security relations.